Can you take one more? When I sat down to play around, I made a couple of shaker cards since I had all the supplies out. Since I didn’t finish this one up in time to make the post, I thought I’d share it today. It’s a departure from my home colors – cream and gold – but I love the contrast of the royal blue and silver. 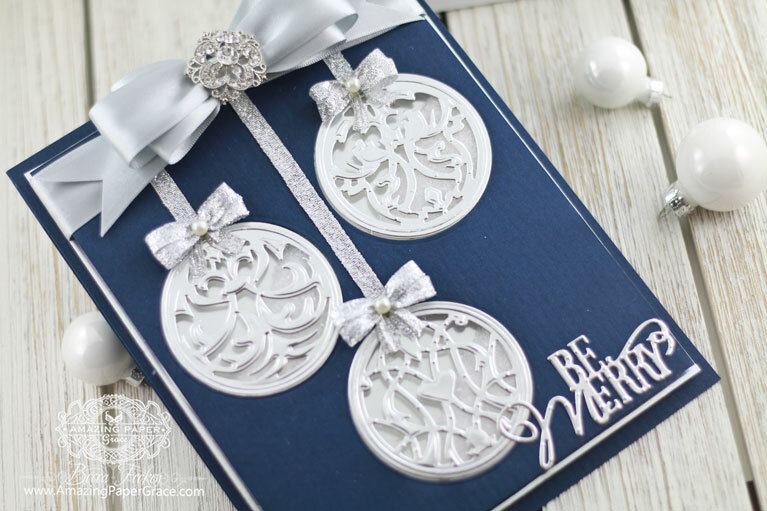 From the batch of new holiday dies, this time around I chose Gilded Ornaments and words from the Naughty or Nice Set. 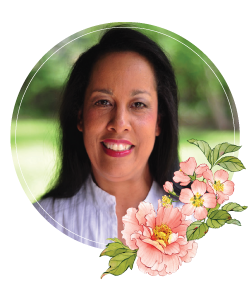 In case you didn’t see my post yesterday where I had another shaker card – it helps to see the inside to know how they are put together – I have some step shots —> HERE (scroll down to the bottom of the post) when I did a guest spot for MFT Stamps. 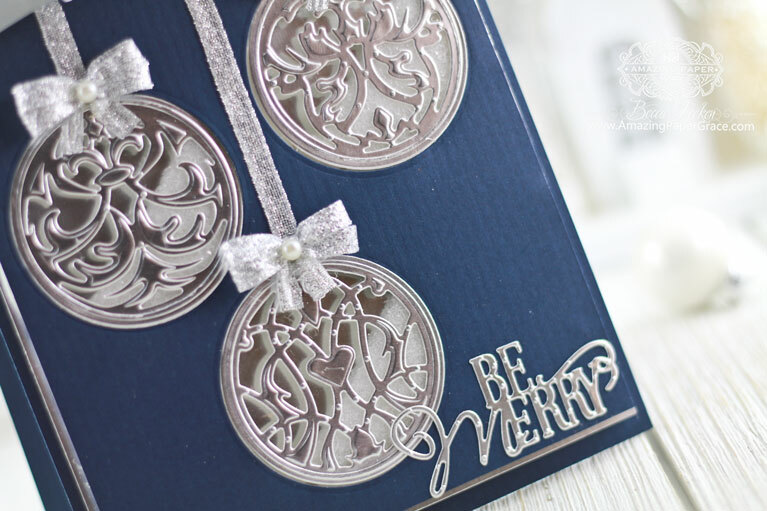 For this particular card I used Twinklets Diamond Dust as the filler for the inside of the ornaments. I think for this card I prefer it over the glitter I had, it feels heavy and moves around inside the card nicely. I hope you are having a lovely weekend! Thank you for popping in! at it and WOW you have done it again !!! Good morning Becca, another winner!!! You’re spoiling us!!! Love the colour it’s yummy and one of my go to colours for Christmas!!! P.S I was wondering if you received my emails??? I just love the Christmas theme and the colours! Yes, Becca you are so right. I just love the dark blue with the silver, just absolutely right for this card. Love it! Wish you could do a short video on the shaker aspect. Two cards this week, I’m so impressed. Thanks for your inspiration. Aww just beautiful Becca, please keep them coming if you have the time. Hi Becca, Another shaker, Gorgeous !! Gorgeous !! Gorgeous !! I absolutely love shaker cards, and this is really beautiful. Yet another stunner! Love this colourway too! Oh, I’ve been used to you not posting for a few days so I missed the 29th and am late for the 30th – note to self “must look every day”!! Both cards are stunning, and you’ve inspired me to make some shaker cards. Like you, it’s years since I’ve had fun this way so thanks for jogging the old brain into action. Hi Becca. Simply stunning card! 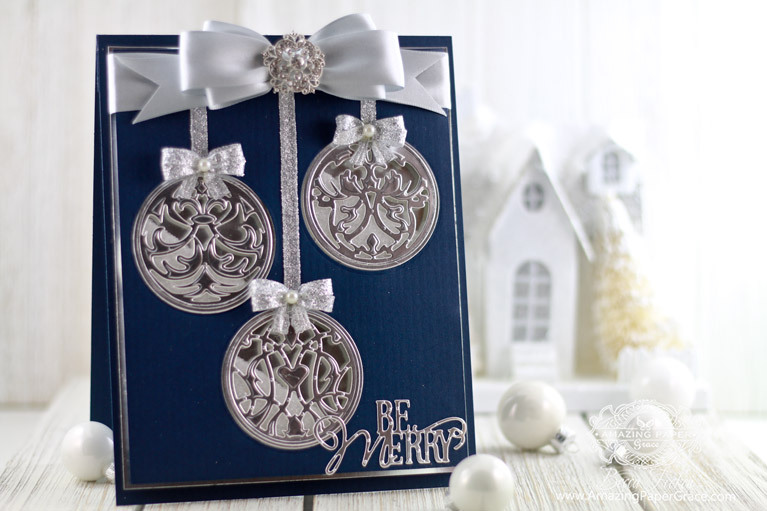 Very stylish and elegant – the blue and silver go so well together. Another winner! So elegant with the color combo blue and silver!